Support for the Phytec PhyNODE KW41Z Board. 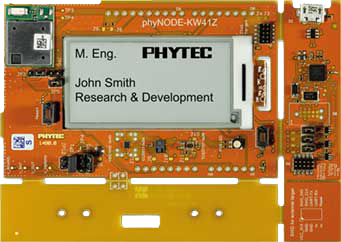 The Phytec PhyNODE-KW41Z board is a development platform based on the PhyWAVE-KW41z wireless module (populated with NXP Semiconductor Kinetis KW41Z microcontroller). It provides a radio device with Bluetooth Low Energy and/or IEEE 802.15.4. There's also available an HDL1010 High Accuracy Digital Humidity sensor, a CCS811 IAQ gas sensor, a MMA8652FC accelerometer and a TCS37727 RGB Light sensor. There board also provides an SSD1673 Active Matrix EPD 150x200 Display Driver with Controller on board. Use BOARD=phynode-kw41z with the make command.